The perfect after-skiing meal. Hearty appetizer, or, pair with bread, apples and other fruits, and enjoy. Toss cheeses with cornstarch until coated. Rub garlic on bottom and side of heavy saucepan or skillet and add wine. Heat over low heat just until bubbles rise to surface (wine should not boil). Gradually add cheeses, about 1/2 cup at a time, stirring constantly with wooden spoon over low heat until cheeses are melted. Stir in kirsch, salt and white pepper. Remove to earthenware fondue dish and keep warm over low heat. Spear bread cubes with fondue forks and dip and swirl in fondue with stirring motion. 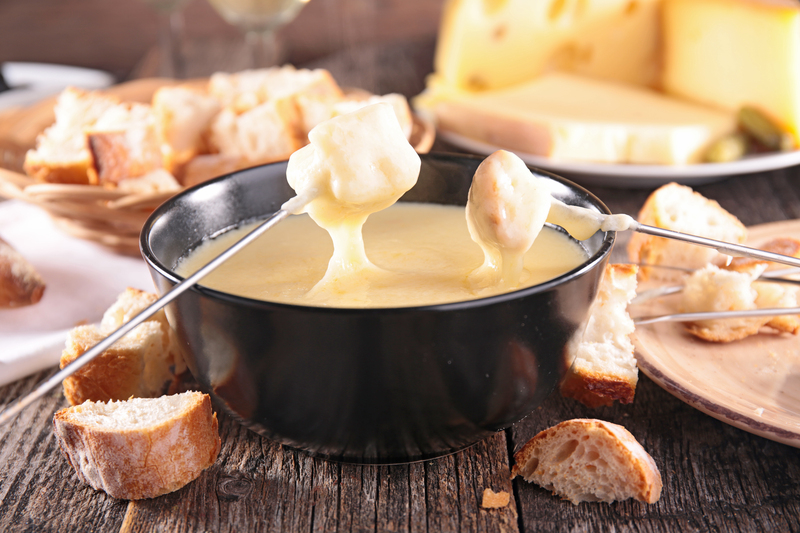 If fondue becomes too thick, stir in 1/4 to 1/2 cup heated wine. NOTE: An additional 2 cups shredded Swiss cheese can be substituted for Gruyere cheese.